Bicolor loops are loops made out of two colors, tied or linked together. 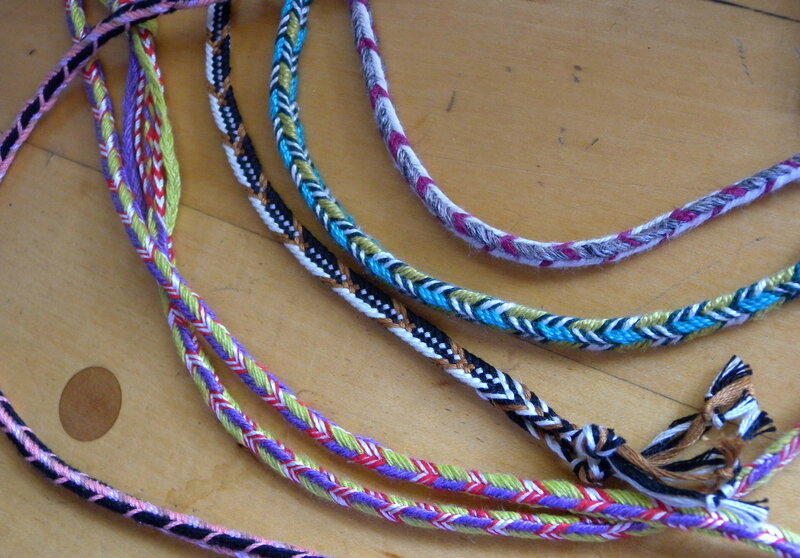 They can create very different braid patterns than the patterns you can get from single-color loops. Before I leave them though, I’m posting this booster for bicolor loops (and a tutorial, see below). 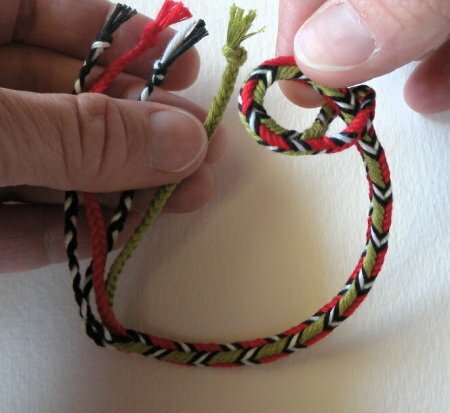 Bicolor loops add so many patterning possibilities to any kind of loop braid, which is why they have been used worldwide in connection with both fingerloop and hand-held loop braiding. In the old English braiding manuscripts they were called departed bowes, or boes—a bow being a loop. A bicolor loop is simply two lengths of yarn of different colors tied together at each end. That’s what makes the magic: as you braid, every time a loop is turned the opposite color emerges on the braid. These color changes can line up on the braid to create interesting patterns. 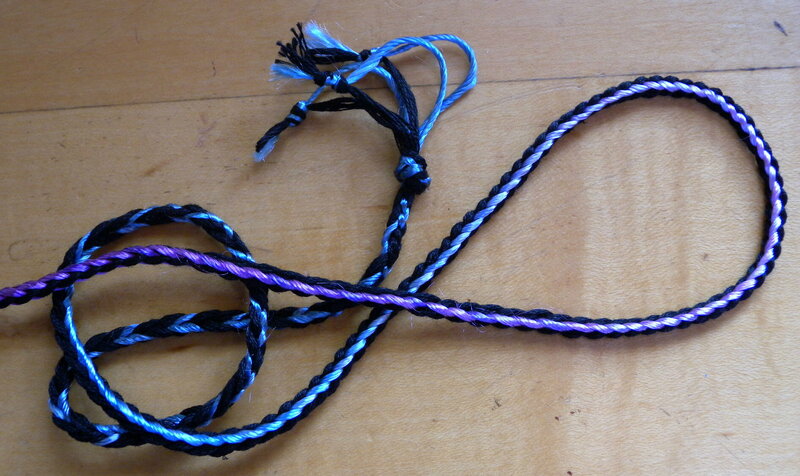 And those patterns can be altered very easily mid-braid (another magical thing about bicolor loops). Bicolor loops are the easiest way to get lengthwise color stripes in a square or rectangular loop braid. This is always a striking look–at least to a braider. Since braids are made on the diagonal, you just don’t expect to see up-and-down vertical striping. It isn’t possible when you use loops of single colors (unless you get into more complicated stuff like linking loops within the braid). With bicolor loops it’s easy to dramatically vary the color pattern mid-braid. It can be very eye-catching on a braid to have one or two bicolor color patterns separated by the lengthwise striping pattern that I call ‘Edge’. In the photo above, any lengthwise stripe of color down a braid was created by a certain set-up of bicolor loops in the braid – just one of many possible bicolor loop patterns. All are square braids except for the black/white/gold braid. underside of top braid is solid orange, of lower braid is solid black. The video in An Unorthodox Braid Tutorial demoes how to make a 7-loop version of the above braids (with black and white on top, and a lower layer of blue). Set up for a square braid, using whatever number of loops you are comfortable with, all loops bicolor (dark-light) and of the same two colors. Easiest set up: Cut 5 lengths of dark and 5 of light (for a 5-loop braid), then tie 2 at a time together at one end (use an overhand knot, not a square knot). 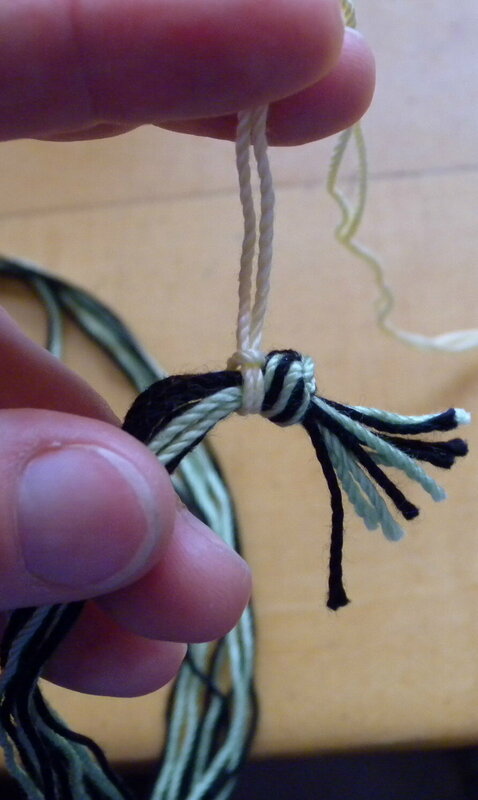 Then take all the untied ends together and tie them into one big overhand knot–that will be the top of the braid. Fasten the header string onto a fixed point. Set up the loops on your fingers such that the loops on one hand have all dark shanks in upper position on your fingers, and the loops on the other hand have all light shanks in upper position. Start braiding a square braid–all loop transfers turned (reversed/ crossed)*. 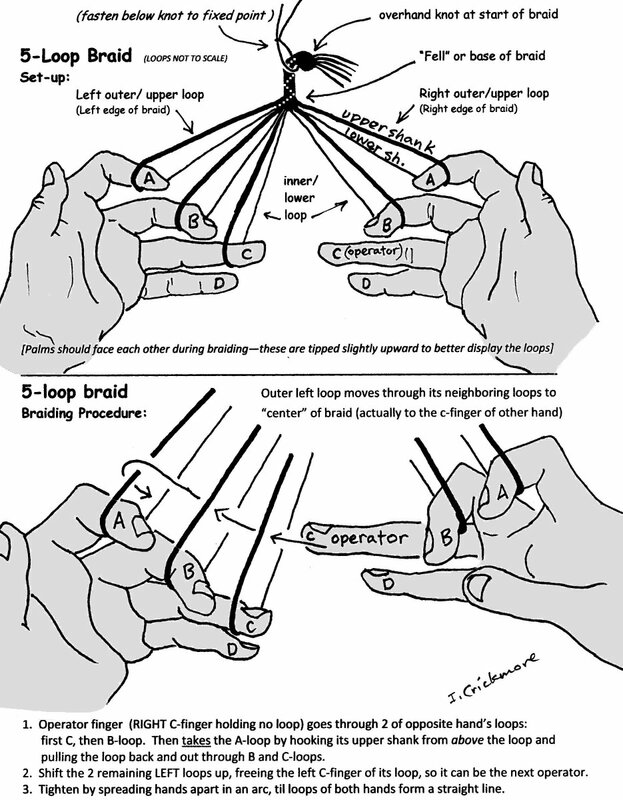 By the way, if you happen to use the A-fell loop braiding method for square braids (index finger reaching through ALL the loops of its own hand to fetch the opposite hand’s c- or d-loop), you can use that method instead of the V-fell method I show here. 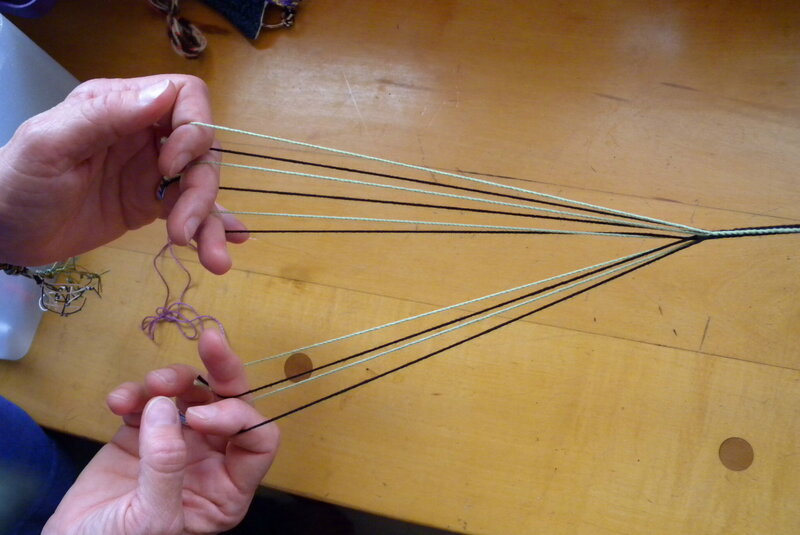 If you braid slentre-style (palms facing the floor), just make sure that you poke the index finger through BOTH/ALL the other hand’s closer loops on the way to fetching the far one–that’s how a square braid is made. Like magic, each loop will turn dark-shank-up when it arrives on the ‘dark loop hand’, and turn light-shank-up when it goes back to the ‘light loop hand’. And along the developing braid you’ll start to see lengthwise dark and light stripes along the 4 ridges of the braid. (beautiful for a drawstring that will be knotted, or for any kind of knotwork). In the old English loop braiding manuscripts this type of pattern was sometimes called “bordered,” or “with the edge.” I call it Edge. A really effective color-pattern variation is to have just one loop (any loop) out of order from the Edge pattern setup. 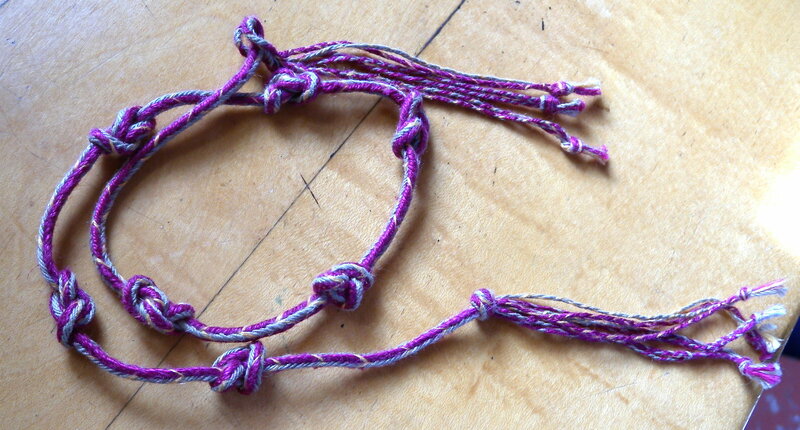 You can start a new braid off this way, or switch to this pattern from doing the Edge pattern. The cleanest way to switch is to make one (and only one) loop transfer “wrong”– ie when you take the loop with the other hand, don’t turn it as you normally would for a square braid, instead take it unreversed/ open/ unturned*. (Choosing to take a loop “wrong” is actually an example of consciously using ‘pick-up patterning’ to create patterns!) Alternatively you could just take any of the loops and turn it manually on its finger so the “wrong” color is uppermost. Then keep braiding normally and a pretty contrast pattern will emerge on the braid. I call it the “one-loop-wrong” pattern. The 2nd variation in the picture above is one you would get if you began braiding with dark (or light) shanks in upper position on both hands. For an in-progress 5-loop braid, you can switch to it from the “edge” pattern in two ways: either by turning loops on your fingers until all the dark shanks are down (or up)—or by making the first, third, and fifth loop transfer with no turn. That equates to the first three transfers from ONE hand, say the left, while all the right hand transfers are done normally (with a turn). For a 7-loop braid, you would make the first four loop transfers (off one hand only) unturned, alternating with regular turned transfers from the other hand. 6-loop square braid. Zebra-stripe chevrons are on the far right. This particular pattern requires an even number of loops. That alternating dark-light pattern doesn’t require using bicolor loops, actually. It can also be made with 3 single-color black loops and 3 single-color gold loops, set up in alternating dark-light order (but see my Color-Planning post for how to set up an ‘alternating’ color order onto your fingers—this isn’t necessarily obvious). However, the “edge” pattern and others would not be possible with single-color loops. Transferring loops “wrong” is the key to smooth pattern changing with bicolor loops. If you made all your loop transfers with no turns for a long stretch of the braid, your square braid would divide into two layers (great for a buttonhole or loop) but just a few unturned loop transfers won’t show up as a visible opening through the braid. The alternative—manually turning loops on your fingers to all be in the correct color-arrangement for the new pattern—might leave a little bulge or other mark at that point in the braid, not really a big deal. 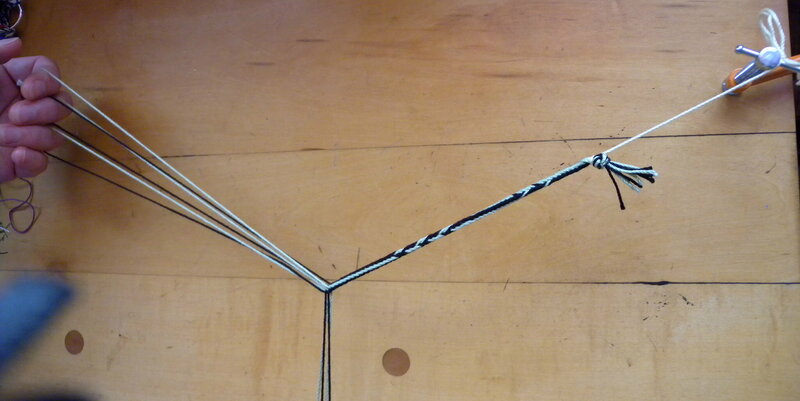 Figuring out which loops to turn “wrong” can be tricky with some patterns, but not in getting back to the Edge pattern—you just aim to have all light shanks up on one hand and all dark shanks up on the other, and make your loop transfers turned or not turned accordingly until you’ve reached your goal. Even if one loop gets by you and ends up with its light shank up on the dark-loop hand, you can catch it on the next round (when it’s time for that loop to come back over to the light-loop hand), and transfer it without a turn then. After following the tutorial above, try using a third contrast color, and otherwise following the instructions above for the ‘Edge’ pattern. Use almost the same loop set-up, except put 2 contrast single-color loops (both the same color) together on the right hand. 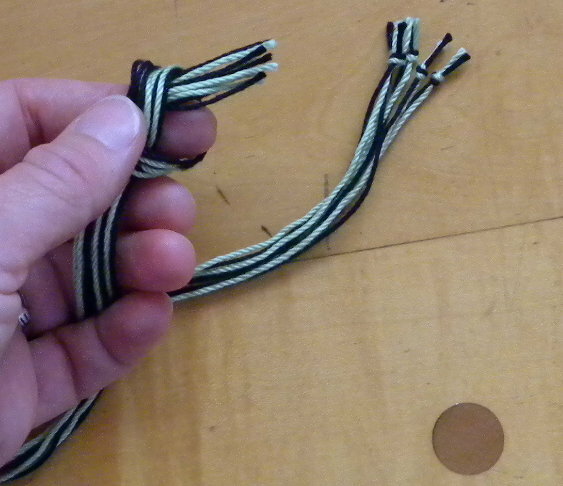 For a 5-loop braid, those two single-color loops would be the only right-hand loops, with 3 bicolor loops on the left hand. 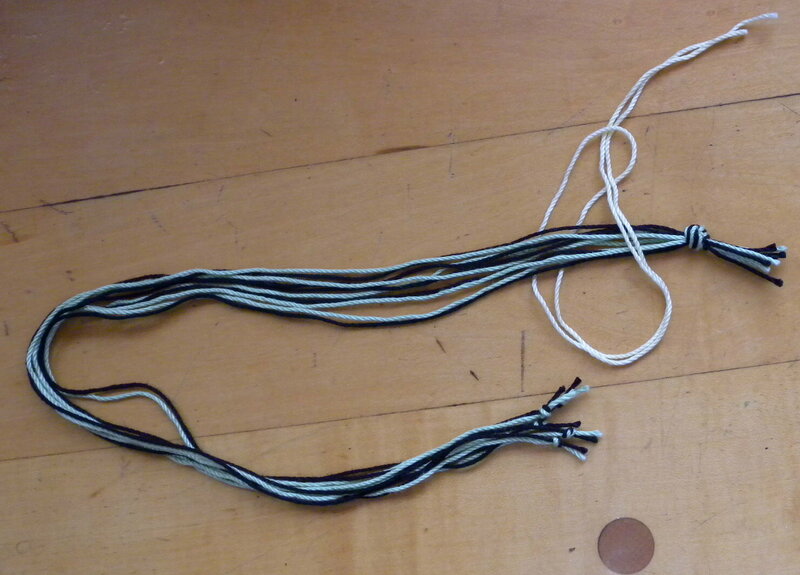 For a 7-loop braid, you would have 4 bicolor loops on the left hand, 2 contrast single-color loops on the right hand (next to each other) plus one bicolor loop as well. Make sure that the one bicolor loop on the right hand is in the opposite dark/light up/down set-up of the 4 bicolor loops on the left hand. See my post on planning color-patterns—explains how to order the loops on your fingers, to get a particular color-order in the braid. Also shows more examples of bicolor loops in combination with solid color loops, in both square and flat braids. *reversed (vs unreversed) are the 15th C terms; turned is 17th C; crossed (vs open) are Noémi Speiser and Masako Kinoshita’s terms. I can’t help preferring turned (vs ‘not turned’ or ‘straight’) myself, as it seems clearer than the other two. 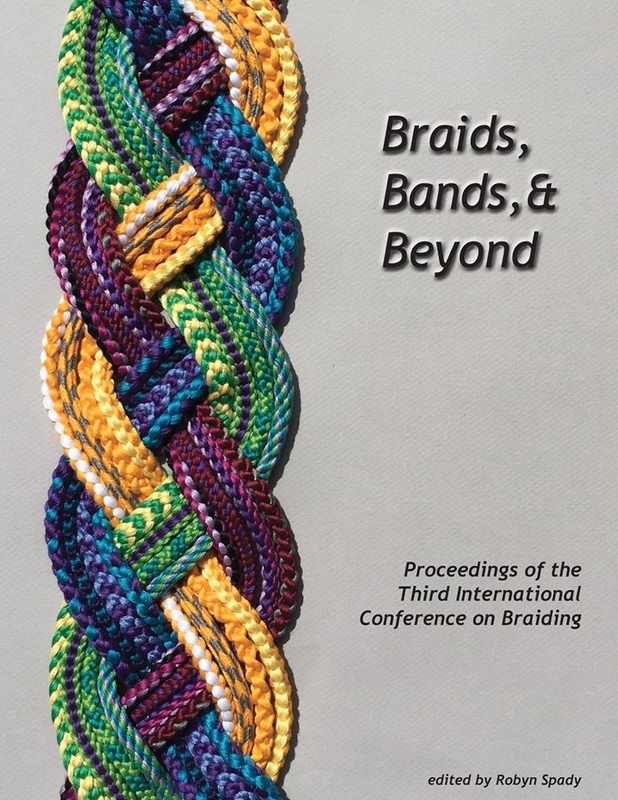 I cite them all because people have various backgrounds in loop braiding. These terms refer to how a loop is transferred from one hand to the other–i.e. how it goes from one side of the braid to the other–whether it goes “straight” across with no turn, or gets rotated in a half-turn so that the upper and lower shanks switch positions. This makes a huge difference to the braid structure–using one or the other, or a combo of the two types of transfers is how you make a braid square, flat, or divide into two braids. Thanks for the set-ups. I’m going to go try a couple. Then I’ll get you some photos. Hi Ingrid. I love what you’re doing here. Would you be willing to post the initial setup for the braids in the picture above showing both bicolor loops and solid loops? I particulary like the green, blue, black & white one. Blue/gold with black/white is a 9-loop square braid. Then braid a square braid. (any method–V-fell, A-fell or Slentre). Right: Thumb, A, B, C all have bicolor blue+gold loops with same color shanks uppermost on all fingers. Remember, the thumb-loop “upper” shank is the shank that is closest to the other hand! (“upper” and “lower” shanks are held horizontally on the thumb, but still go to the upper and lower surface of the braid, respectively. It’s an 11-loop square braid, very similar pattern to the one I just described. Substitute green + purple for the bicolor loops and red and white for the single-color loops. With an 11-loop version, don’t use a mix of fine linen and high-twist silk for a pattern like this (single colors alternating)… Turns out that’s what made the pattern so messy–works ok with slightly heavier cotton but with this mix of fine silk and linen, a single loop can slide down into the surface of the braid and ‘disappear’ temporarily! For fine slippery fibers in ‘too-many-loop’ square braids I recommend using at least 2 adjacent loops of the same color rather than one loop by itself. I would love to see pictures of your braids, Julie! If you make some you wouldn’t mind sharing on this blog, send me an email with the photos attached. Happy braiding! Thanks, Doug, I’d love to have a copy! I’ll email you. Hopefully, your time off was pleasant. Everyone needs it to be at their best. The 6-loop treated as a 5-loop square comes out with one rounded edge on the triangle, which side has a pattern distinctively different from the others, quite intriguing – and I’m still trying to think of a use for it. Still not a lot of luck on the bird pattern front, and I’m still trying to convince myself to break down and buy the Letterbraid book – hard to do on unemployment though…I agree that’s probably where I need to be looking – and I’ll probably have to chart a design myself, based on how the letters are generated – fortunately, I’ve worked out a way to do the 14-loop pattern needed for that by myself in the A-fell method, challenging but very fun. I do have one pattern that generates a thunderbird design (upswept ‘wings’) on a round braid, I’ve dubbed it the ‘Spiaggian Eagle’, in honor of the SCA group I belong to. I have the pattern written up in a Word document. If you would like a copy, I can forward it to you off-list. Hi Doug, I’m sorry it took me so long to reply, I’ve been away from my computer almost a month. Your 4 loop braid sounds really unusual, I’ll have to give it a try after I finish unpacking. It’s not an orthodox twill one, that’s clear from your description. A lot of unorthodox braids end up beveled or triangular, but yours sounds more unusual than even the “regular” unorthodox braids! When you take the loop reversed/with a turn, do you take the top shank from ABOVE the loop, or do you take the bottom shank from BELOW the loop? Doesn’t matter with orthodox (square) braids but it can make a difference with unorthodox braids in how the final shape turns out. I’ll try both ways but am curious how you did it. I know Dominic was looking for a 6-loop bicolor braid, and it got me thinking about even numbered braids…I played around and made a fun one using 4 loops that winds up triangular! Very simple, 2 loops each of 2 colors. loops on ABC Left and C Right. Using B Right, take C Left through C Right, then Using A Right, take B Left through B & C Right. then shift A Left to C Left and repeat. If you alternate your colors, you get a zigzap pattern, if you gorup them you get a snakeskin-type pattern. 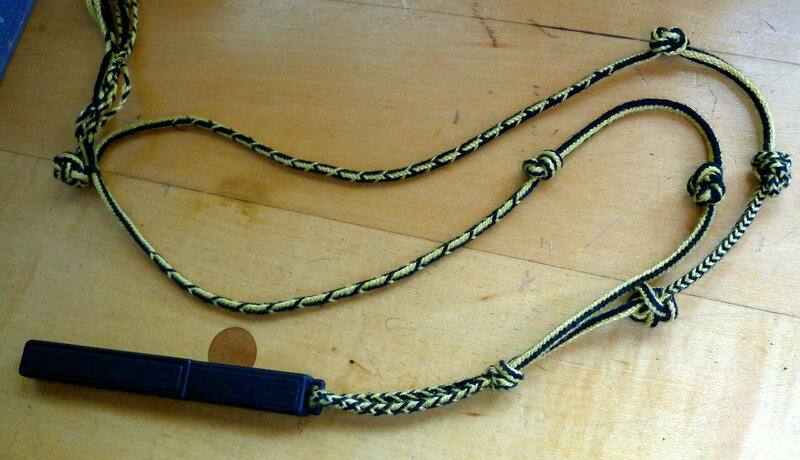 well i just finished the piece i was working on – the straps for a ditty bag. i needed clean loops because by interlocking 2 braids i could achieve the 8 foot it needed. loops were okaaay; anyway, decided if i waited for perfect loops (which means really understanding the braid structure), it would never happen. i used your tucking method – badly! if you want knot ideas there are plenty – would it be possible to have an email address to send photos & tutorial links to? or tell me another way. one simple one for a stopper is to tie an overhand knot next to a looped end and pass the loop over the knot, tightening the whole thing into the loop. if you’ve understood it you will end up with as perfect a torus as is possible with string-rope. thanks for the refreshing comments about the website, haven’t updated it in ages and after our interaction and others since my knot madness set in, am thinking that a blog is much more flexible and useful. its been a great pleasure to be helped by so many other workers through the ether. next week off to france where i will buy tarred seine line – which i’ve been dying to use for months; then to england to pick up gold and silver wire. can’t wait to combine all that in a braid. I sent you an email, would love to see/post pics of your braids/ fancy work. Your tarred seine twine and gold and silver wire sound very intriguing! I have to look up “torus”! but if I understand your stopper knot description correctly, I think it is something I sometimes do for closures on bracelets/ lanyards. i can’t find instructions for a six-loop braid anywhere. i tried with bicolours doing AR THROUGH B,C,DR taking DL rev. and then AL THROUGH C,DL taking DR rev. but wasnt very satisfactory (want square braid). using hemp so it sticks quite a bit whereas 5 loop is great. what are the 6 loop instructions for sq. braid? the trouble was i wanted to start with a split braid for a neat loop at the beginning but if you want the bi-loop pattern you always seem to need six loops to avoid a knot at the beginning. am i making sense? do you have any solution – on your photos you often have split-loop at one end of your samples? you give links to imbric tutorials but it always demands a log in and i can’t find how to register? Your description is correct for a six-loop A-fell braid. Try tightening differently. Be sure you are stretching the loops all the way apart, ie until they make an almost-straight line from one hand to the other. Stretch them apart in a smooth arc rather than jerking, and rock/repeat this move a couple of times to gently sock in the interlaced pattern at the fell of the braid. Don’t pull hard, just open widely. It’ll be much easier for now to start with a knotted top of loose ends as shown in the mini-tutorial, and finish the loose ends neatly later. Start with a few cycles of square braiding, then a divided section which will form the loop if you want one (i.e. don’t turn any of the transferring loops for that section), then resume square braiding after making sure that all dark shanks are up on one hand, light shanks up on the other. Then after the braid is done you can undo the initial knot and finish the loose ends in a pleasing way, either by making them into a neat tassel, or by tightly binding/whipping, sparingly gluing, cutting off the loose ends–then covering the stub with an end-cap or with nautical covering-knots.